Being a parent is a tough job, and when you’re balancing it with additional children, work, physical activity and sanity, it can get all the more challenging. One of the solutions to freeing up some more time in your day is to have your child attend daycare. Aside from this being a fantastic way to get some more “you-time,” there are countless benefits that your child will see by attending. We’re going to cover a few of them in today’s blog post. Whether you’re taking them to daycare every day or it’s something that they’re attending on a bi-weekly basis, visiting a daycare is a fantastic way to introduce a routine to your child’s life. Sure they get some type of routine while they’re at home with you, but it’s very different from the kind of schedule that they’ll maintain once they’re in school. At Child’s World Academy, we focus heavily on the routine of your child so that they begin to understand their own schedule and adapt over time. You may be your child’s best friend right now, and you’ll always have their heart, but it’s essential that they also get some time to socialize with children their age. 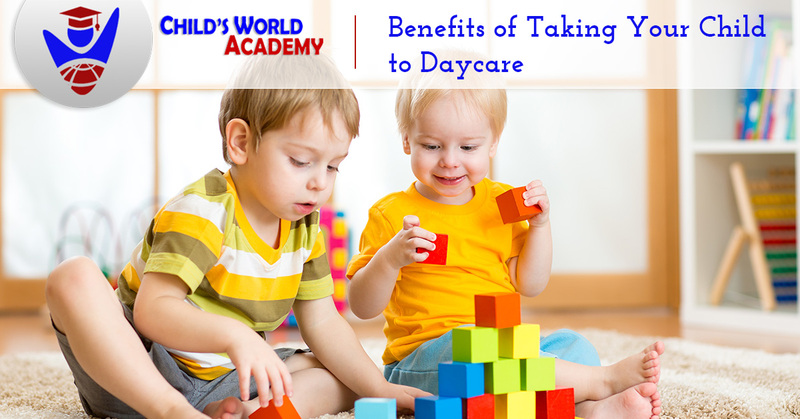 Attending daycare is a fantastic way to introduce them to children their own age and teach them some of the standard socialization skills that they’ll need throughout their life. From sharing and respect to starting conversations and building friendships, children gain quite a bit of social skills regardless of how young they are. Getting them started sooner than later is a great way to build self-confidence, self-awareness, and develop personality traits. This is also essential to help your child get comfortable in a school setting. Going from no time at school to full days in Kindergarten is a rough transition, which is why we don’t suggest doing that. Doing this to your child means putting them in a group of children their age, which they’ve had little to no contact with at this point, and expecting them to manage a full schedule. Rather than throw them to the sharks to see how they’ll do, we suggest at least one year of daycare. You could start with half-day programs a couple of times a week and build up to a full-time schedule. This will help prepare your child for what’s to come in kindergarten and will make the transition significantly smoother for them. There are countless other benefits to having your child attend a daycare facility, and we’ll be sure to touch on some additional ones in our next blog post. Make sure to keep an eye out for it! If you’re interested in learning more about our daycare and the types of programs that we offer, browse the classes that we have available and feel free to contact our team with any questions that you may have. We do our best to make sure that the enrollment process is easy for you, so let us know if there’s anything that we can do to help. We hope to see you soon!